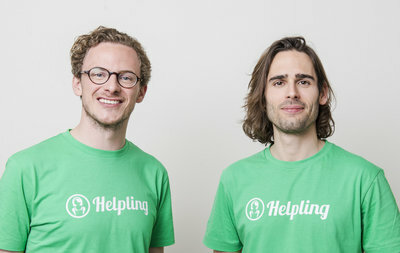 Berlin & London, 3rd of July 2015: Helpling, the leading global platform for on-demand home services, announced today the acquisition of Hassle.com, the European pioneer of this business model and market leader in the UK. This move sees them become the clear leader for online booking of household services outside the U.S. Both Helpling and Hassle.com enable customers to book a local, vetted cleaner online or via a smartphone app. This means people no longer have to search through classified ads or ask their friends for recommendations. Consumers can now find a local cleaner they trust online and within just a few clicks. Hassle.com has pioneered this business model in Europe since its inception in December 2012. It has enjoyed first mover advantage in UK and Ireland and is the clear market leader there. Hassle.com is backed by Accel Partners - investors in Facebook, Etsy, Spotify, Dropbox and Atlassian. Hassle.com has also cultivated customer and cleaner loyalty and has worked for the past three years to ensure it has the best in class product experience. Helpling’s expertise is scale and speed. Helpling launched one year ago and is already leading across 12 markets. Helpling has raised EUR 56,5M from Lakestar, Mangrove, Rocket Internet and other high profile investors to continue its path of sustainable growth. These complementary strengths of Helpling and Hassle.com will allow the company to further expand its leadership position in Europe. Together Helpling and Hassle.com will operate in 14 markets holding strategic cities such as London, Berlin and Paris.Over the next months, the company will deploy substantial capital to increase its leadership position with a clear focus on organic growth. Hassle.com will continue to operate under its established brand. The founding team of Hassle.com will take on additional responsibilities within the group as global co-founders. Alex Depledge will assume CEO responsibilities for English-speaking markets, Jules Coleman will become group CPO and Tom Nimmo will lead the Hassle.com platform as CTO. Accel Partners will join the board of investors of Helpling. Henrik Persson, Partner at Lakestar, said: “Home services is the next big frontier for online market places. By combining the two best and largest companies in Europe we create a clear market leader. We are excited to continue to build this winning company together with the outstanding team and some of the smartest market place investors around." This deal follows significant milestones for both companies. Helpling recently launched in Singapore and the UAE. A few weeks later Helpling announced its Series-B funding of EUR 43M. Hassle.com launched in Paris in October last year, quickly becoming one of the dominant players. The company has been hailed one of the hottest technology firms in Europe and in June 2015 it won Best Sharing Economy company at the TechCrunch Europas. Hassle.com is an online marketplace that matches busy working professionals with local trusted cleaners for the home. It allows you to find, book and pay for your cleaner’s time via its online platform. Hassle.com’s mission is to help busy people reclaim their free time and maintain a calm, clean and happy home. Customers simply visit www.Hassle.com, type in their postcode and choose a cleaner who suits their needs. Hassle.com charges a flat rate of £10 per hour for cleaning. Cleaners get paid up to £8.50 p/h, well above minimum wage. Hassle.com is a graduate of the UK accelerator programme, Springboard (now known as TechStars London) and won Start-Up of the Year at Tech City Awards in 2013. Find out more about Hassle.com on Facebook or interact on Twitter. 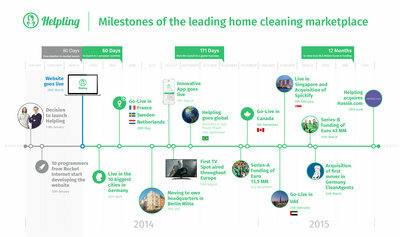 The Berlin based startup Helpling is the leading global online platform for on-demand home services. Customers can book a vetted and insured cleaner in a couple of clicks. The innovative online service gives people more time to enjoy the nice things in life: family, friends and free time. Helpling was founded by Benedikt Franke, Philip Huffmann and Rocket Internet in January 2014. The company currently offers its service in more than 14 countries globally. This makes Helpling the most widely available online marketplace for on-demand home services in the world.